V.I.S.I.O.N. 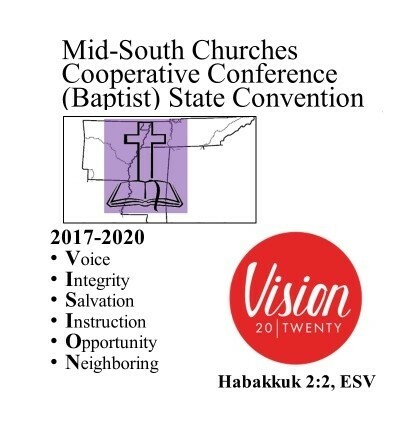 2020 (V-2020) is the Mid-South Churches Cooperative Conference State Convention’s (MSCCC) three-year strategic plan. Supported by six principles, V-2020 seeks to better position MSCCC in being a resource for member and cooperative churches/organizations and their constituents in fulfilling the Great Commission. We must be congregations that reflect God’s agape love to all through Christian stewardship of the resources that God has blessed us with. We must be intentional about saving the lost and nurturing the saved. We must make Christian education the bedrock foundation of our congregations with a special emphasis on reaching the Millennial generation. We must not be afraid to take advantage of the opportunities that God has prepared for us including both religious and secular opportunities. We must work to make reality Dr. Martin Luther King, Jr.’s “beloved community” based on justice, equal opportunity, and love of one's fellow human beings; don’t attend church – be the church!